This is my first Sunday back after the XMas holidays. John has been working here all through XMas. Thanks John! We worked in the Southern end of the bushland, mainly removing veldgrass that has survived the winter spraying. We also came across some Victorian Ti Tree and Fountain Grass (lots of it!). I didn't have the tools required to remove the bigger Fountain Grass clumps, so will need to return better equiped next week. There is also lots of Pelargonium in the Defence Department land that is moving into the bushland - we will need to contact the Defence Department to remove it. Click here to view live mapClick here to download the GPX data for this map. 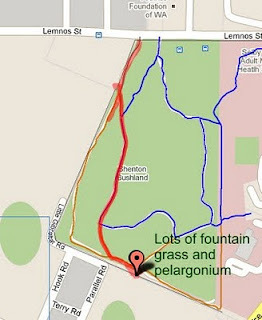 Note, this data is an XML file - change the name to .GPX to upload to your GPS. How could we have missed it?